GRAFENWOEHR, Germany – U. S. Army Garrison Bavaria has thrift shops available in four of its five communities: Tower Barracks, Rose Barracks, Hohenfels and Garmisch. The thrift shop on Tower Barracks is located in Bldg. 508. It is open on Tuesdays and Wednesdays from 10 a.m. to 3 p.m., Thursdays from 11 a.m. to 5 p.m. and the first Saturday of every month from 10 a.m. to 3 p.m. For more information, call DSN 475-0377 or on a civilian line at 09641 92 60377. The thrift shop on Rose Barracks is located in Bldg. 221. It is open on Tuesdays from 11 a.m. to 5 p.m., Wednesdays and Thursdays from 10 a.m. to 3 p.m. and the first Saturday of the month from 10 a.m. to 3 p.m. For more information, call DSN 476-2649 or on a civilian line at 09662 83 2649. The thrift shop on Hohenfels is located in Bldg. 334. It is open on Tuesdays thru Thursdays from 9 a.m. to 5 p.m. and Saturdays from 10 a.m. to 3 p.m. For more information, call DSN 466-3278 or on a civilian line at 09472 83 278. The thrift shop on Garmisch is located in Bldg. 212. It is open Wednesdays from 10 a.m. to 2 p.m., Fridays from 10 a.m. to 4 p.m. and the first Saturday from 10 a.m. to 4 p.m., and third Sunday from 12 p.m. to 3 p.m. For more information, call DSN 440-3552 or on a civilian line at 08821 70 3552. It is a good idea to call ahead when planning to visit any of the thrift stores, as the days and times can change. The thrift shops sell gently used clothing and household items that have been donated, or put on consignment, by members of the community. The shops are open to anyone from the local community who are in Germany under the Status of Forces Agreement, including German nationals, provided they have a valid ID. 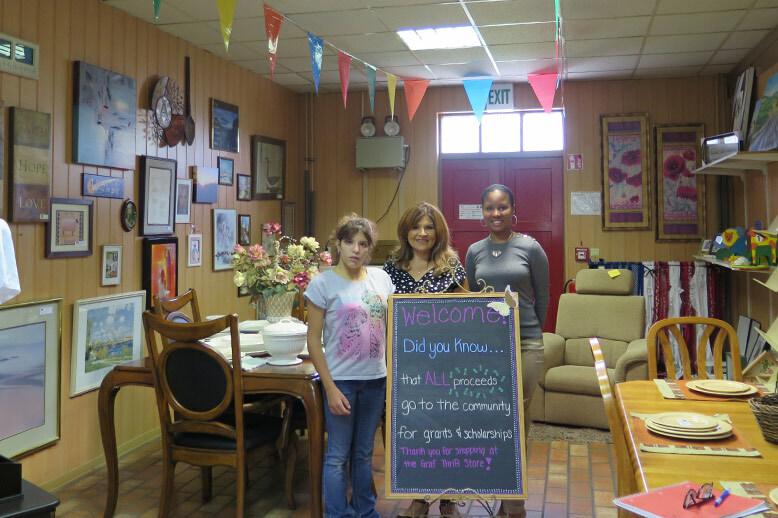 In addition to selling items to patrons, the thrift shops donates items to Army Community Service for service members in need and to local Bavarian orphanages, said Lorenna Browning, assistant manager, Grafenwoehr Thrift Shop. Each thrift shop is overseen by a manager, assistant manager, and store clerk – all who receive a salary. Once those personnel and anyone with consigned items are paid, the remaining money is distributed back into the community in the form of grants and scholarships. According to the figures provided by the Bavarian Community Spouses Club, contributions from both thrift shops, and other fund raising initiatives, raised $37,000 in grants to schools and private organizations associated with USAG Bavaria in 2016. In addition, over $21,000 in scholarships to students at eleven colleges and universities were awarded. Volunteers are always welcome, and anyone wishing to donate their time should contact any of the stores. There is a lot involved in running each thrift shop, and volunteers work to sort items, set up displays, greet customers, and keep track of donations and consignments, said Browning. Each thrift shop offers discounted prices in exchange for hours spent volunteering. The discounts can vary between each thrift shop. Consignments are received at the front desk in Grafenwoehr on Wednesdays from 10 a.m. to 2 p.m. and on Thursdays from 11 a.m. to 4 p.m.
Consignments are received at the front desk in Vilseck on Tuesdays from 11 a.m. to 4 p.m. and on Wednesdays 10 a.m. to 2 p.m.
Consignments are received at the front desk in Hohenfels on Tuesdays from 8 a. m. to 5 p.m., Wednesdays from 11 a.m. to 3 p.m., Thursdays from 8 a.m. to 6 p.m., the first Saturday of the month from 10 a.m. to 1 p.m. and the third Saturday of the month from 12 p.m. to 1 p.m.
Consignments are received at the front desk in Garmisch on Wednesdays from 10 a.m. to 2 p.m., Fridays from 10 a.m. to 4 p.m. and on the Saturdays the store is open. Is it a good idea to call ahead when planning to take items in for consignment. Anyone consigning an item must sign a contract. Patrons may only consign only 10 items at a time. Consigned clothing must be seasonally appropriate. Consignees receive 70 percent of the item’s sale price. For more information about becoming a member of the Bavaria Community Spouses Club, or the thrift shops, visit www.bavariacsc.com.